Indeed, the concept of microfinance is not new in Ghana. There has always been the tradition of people saving and/or taking small loans from individuals and groups within the context of self-help to start businesses or farming ventures. For example, available evidence suggests that the first credit union in Africa was established in Northern Ghana in 1955 by Canadian Catholic missionaries. However, Susu, which is one of the microfinance schemes in Ghana, is thought to have originated from Nigeria and spread to Ghana in the early twentieth century. Promulgation of PNDC Law 328 in 1991 to allow the establishment of different categories of non-bank financial institutions, including savings and loans companies, and credit unions. Informal suppliers such as susu collectors and clubs, rotating and accumulating savings and credit associations (ROSCAs and ASCAs), traders, moneylenders and other individuals. In terms of the regulatory framework, rural and community banks are regulated under the Banking Act 2004 (Act 673), while the Savings and Loans Companies are currently regulated under the Non-Bank Financial Institutions (NBFI) Law 1993 (PNDCL 328). On the other hand, the regulatory framework for credit unions is now being prepared, and this would recognize their dual nature as cooperatives and financial institutions. The rest of the players such as FNGOs, ROSCAS, and ASCAs do not have legal and regulatory frameworks. Programmes currently addressing the sub-sector in Ghana include the Financial Sector Improvement Project, Financial Sector Strategic Plan (FINSSP), the Rural Financial Services Project (RFSP), the United Nations Development Programme (UNDP) Microfinance Project, the Social Investment Fund (SIF), the Community Based Rural Development Programme (CBRDP), Rural Enterprise Project (REP), and Agricultural Services Investment Project (ASSIP). The recognition that microfinance can have significant impact on cross cutting issues such as women's empowerment, reducing the spread of HIV/AIDS and environmental degradation as well as improving social indicators such as education, housing and health. It helps to empower women by supporting women's economic participation and so promotes gender equity. The literature suggests that micro- finance creates access to productive capital for the poor, which together with human capital, addressed through education and training, and social capital, achieved through local organization building, enables people to move out of poverty. By providing material capital to a poor person, their sense of dignity is strengthened and this can help to empower the person to participate in the economy and society (Otero, 1999). The aim of micro-finance according to Otero (1999) is not just about providing capital to the poor to combat poverty on an individual level, it also has a role at an institutional level. It seeks to create institutions that deliver financial services to the poor, who are continuously ignored by the formal banking sector. Littlefield and Rosenberg (2004) argue that the poor are generally excluded from the financial services sector of the economy so MFIs have emerged to address this market failure. 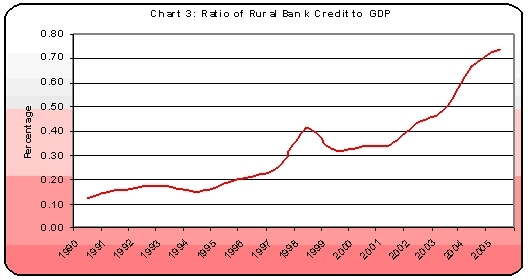 By addressing this gap in the market in a financially sustainable manner, an MFI can become part of the formal financial system of a country and so can access capital markets to fund their lending portfolios, allowing them to dramatically increase the number of poor people they can reach (Otero, 1999). More recently, commentators such as Littlefield, Murduch and Hashemi (2003), Simanowitz and Brody (2004) and the IMF (2005) have commented on the critical role of micro-credit in achieving the Millennium Development Goals. According to Simanowitz and Brody (2004, p.1), micro-credit is a key strategy in reaching the MDGs and in building global financial systems that meet the needs of the most poor people." Littlefield, Murduch and Hashemi (2003) state "micro-credit is a critical contextual factor with strong impact on the achievements of the MDGs. Micro-credit is unique among development interventions: it can deliver social benefits on an ongoing, permanent basis and on a large scale". However, some schools of thought remain skeptical about the role of micro-credit in development. For example, while acknowledging the role micro-credit can play in helping to reduce poverty, Hulme and Mosley (1996) concluded from their research on micro-credit that "most contemporary schemes are less effective than they might be" (1996, p.134). The authors argued that micro-credit is not a panacea for poverty-alleviation and that in some cases the poorest people have been made worse-off. Sustainable access to microfinance helps alleviate poverty by generating income, creating jobs, allowing children to go to school, enabling families to obtain health care, and empowering people to make the choices that best serve their needs." (Kofi Annan, December 2003). Although microfinance is not a panacea for poverty reduction and its related development challenges, when properly harnessed it can make sustainable contributions through financial investment leading to the empowerment of people, which in turn promotes confidence and self-esteem, particularly for women. The main goal of Ghana's Growth and Poverty Reduction Strategy (GPRS II) is to ensure "sustainable equitable growth, accelerated poverty reduction and the protection of the vulnerable and excluded within a decentralized, democratic environment". The intention is to eliminate widespread poverty and growing income inequality, especially among the productive poor who constitute the majority of the working population. According to the 2000 Population and Housing Census, 80% of the working populations are found in the private informal sector. This group is characterized by lack of access to credit, which constrains the development and growth of that sector of the economy. Clearly, access to financial services is imperative for the development of the informal sector and also helps to mop up excess liquidity through savings that can be made available as investment capital for national development . Unfortunately, in spite of the obvious roles that microfinance institutions have been playing in the economy particularly over the last twenty years, there is lack of data on their operations. It is known that loans advanced by microfinance institutions are normally for purposes such as housing, petty trade, and as "start up" loans for farmers to buy inputs for farming and this includes rice seeds, fertilizers and other agricultural tools. Some of the loans are used for a variety of non-crop activities such as: dairy cow raising, cattle fattening, poultry farming, weaving, basket making, leasing farm and other capital machinery and woodworking. Of course, funds may be used for a number of other activities, such as crop and animal trading, cloth trading and pottery manufacture. There are other instances where credit is given to groups consisting of a number of borrowers for collective enterprises, such as: irrigation pumps, building sanitary latrines, power looms, leasing markets or leasing land for cooperative farming. For example, trends in loans and advances extended to small businesses, individuals and groups by the Non-Bank Financial Institutions(NBFIs) in Ghana amounted to GH¢50.97 million in 2002 as against GH¢39.64 million in 2001, indicating about 28.6 per cent growth. The amount of loans extended by NBFIs further increased from GH¢70.63 million in 2003 to GH¢72.85 million in 2004, suggesting 3.1 per cent growth. In 2006 alone, total of GH¢160.47 million was extended to clients, which represents 48.8 per cent higher than the previous year's total loans and advances granted by these microfinance institutions(see Chart). 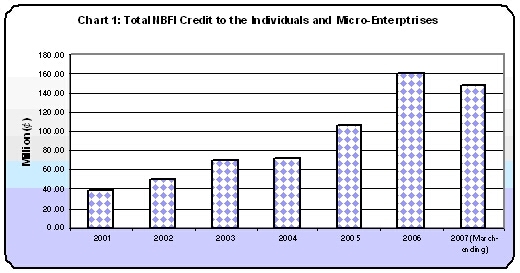 The upward- trending NBFI's credit to individuals, small businesses, groups and others indicates marked improvements in level of microfinance in the country. 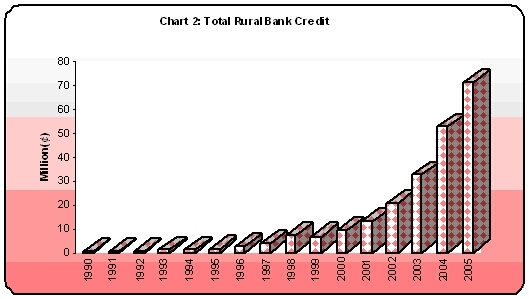 The Rural and Community banks also play very important role in microfinance in the country. These banks were established specifically to advance loans to small enterprises, farmers, individuals and others within their catchment areas. Total loans advanced to clients by all community and rural banks in Ghana was GH¢20.68 million in 2002 compared to GH¢13.12 million in 2001, suggesting an increase of 28.6 per cent. The amount of loans further increased from GH¢71.63 million in 2005 to GH¢115.10 million in 2006, thus indicating 35.4 per cent respectively (see chart). Economically active poor who are clients of microfinance products and services. Business Development Service Providers to MFIs and their clients. Universities, training and research institutions. The Bank of Ghana's history of promoting the financing of Micro, Small and Medium Enterprises (MSME) began from the Credit Guarantee for Small Borrowers scheme in 1969 through the Development Finance Department of the Bank. The Bank was further instrumental in administering the IDA-financed Fund for Small and Medium Enterprise Development (FUSMED) Project, and also with the Private Enterprise and Export Development (PEED) Project, as well as other direct projects that were ended after BOG decided to focus on its core areas of operation. Currently, BoG is actively participating in the Rural Financial Services Project (RFSP). This project was supported by donors such as the International Development Agency (IDA) of the World Bank, the International Fund for Agricultural Development (IFAD), and the African Development Bank (AfDB). It is aimed at broadening and deepening financial intermediation in rural areas through measures such as; Capacity Building of the Informal Financial Sector, Capacity Building of Rural and Community Banks, and the establishment of an Apex Bank for Rural Banks in Ghana. Generally, the range of players in providing financing facilities for the MSME sector is shown in Table 1 below. From 1990, support for micro, small and medium enterprises was intensified with the establishment of the National Board for Small-Scale Industries (NBSSI). In 1991, the NBSSI was merged with the Ghanaian Enterprises Development Commission (GEDC) and this made the NBSSI to take over the functions of the latter - in particular the delivery of credit to small scale entrepreneurs. Its main financing window was a USD30 million Fund for Small and Medium Enterprise Development (FUSMED) - that was provided under the World Bank's small and medium enterprises project and managed at the Bank of Ghana. The fund offered credit to enterprises in all sectors of the economy except primary agriculture, real estate and trading. However the repayment perfomance turned out to be less than satisfactory. 1.Financial Institutions Major Banks, Rural banks, Community banks, non-bank financial Institutions, etc. Sinapi Aba Trust, CARE International etc. Currently, the projects that are on-going for the MSME sector include the Financial Sector Improvement Project, Financial Sector Strategic Plan (FINSSP), the Rural Financial Services Project (RFSP), the United Nations Development Programme (UNDP) Microfinance Project, the Social Investment Fund (SIF), the Community Based Rural Development Programme (CBRDP), Rural Enterprise Project (REP), and Agricultural Services Investment Project (ASSIP). A recent impact assessment  of the plethora of MSME financing programs that have been implemented across the country suggests that significant challenges remain in ensuring the effectiveness of MSME programs. The study found that access to finance was a significant problem for MSMEs, even though other problems such as low cash flow, energy, high cost of non-labour inputs, increasing competition, and high cost of credit were also cited. The next section outlines some of the remaining challenges facing the microfinance sector in Ghana. Generally, since the beginning of government involvement in microfinance in the 1950s, the sub-sector has operated without specific policy guidelines and goals. This partially accounts for the slow growth of the sub-sector, and the apparent lack of direction, fragmentation and lack of coordination. There has so far not been a coherent approach to dealing with the constraints facing the sub-sector. Among the constraints are inappropriate institutional arrangements, poor regulatory environment, inadequate capacities, lack of coordination and collaboration, poor institutional linkages, no specific set of criteria developed to categorize beneficiaries, channeling of funds by MDAs, lack of linkages between formal and informal financial institutions, inadequate skills and professionalism, and inadequate capital. Better coordination and collaboration among key stakeholders including the development partners, government and other agencies, could help to better integrate microfinance with the development of the overall financial sector. Secondly, traditional commercial banking approaches to microfinance delivery often does not work. According to traditional commercial banking principles, the credit methodology requires documentary evidence, long-standing bank-customer relationship and collateral, which most micro and small businesses do not possess. The commercial banking system, which has about twenty-three (23) major banks, reaches only about 5% of households and captures 40% of money supply . Therefore there is room for expanding the microfinance sector in Ghana. "What we are doing is somewhat unique. Not only are we creating an account for Susu Collectors to deposit their funds, we are also providing them with loans of their own, which they can 'lend-on' to their customers, helping them build their capital. In the process, we are laying the building blocks for a truly financially inclusive society. Currently, over three quarters of Ghanaian society may not have access to high street banking. We are also providing capacity building training to Susu Collectors to make sure that they do their credit risk correctly and any training needs they may need". It is gratifying to note that the Government of Ghana has adopted microfinance as one of the important strategies for poverty reduction and wealth creation. Recognizing the role various institutions and individuals can play to ensure the achievement of this national vision of achieving the MDGs and also becoming a middle income country by the year 2015, there is the need to quicken the pace of reforms in the microfinance sector in order to unleash its full potential for accelerated growth and poverty reduction. Finally, while Ghana has a reasonably diversified and supervised regulatory framework for formal financial institutions licensed by BoG, there is concern that appropriate regulation needs to be extended to other institutions operating in the microfinance sub-sector (for example the legal framework for credit unions) in order to improve the outreach, sustainability and efficiency of savings, facilitate credit delivery, and institutional arrangements. The specific challenges facing the industry are discussed into more detail below. The stakeholders in the sub-sector play various roles which are expected to be complementary. Due to the lack of defined areas of operation, the roles and responsibilities of stakeholders currently overlap in some cases. The overlap is also due partly to the fact that organizational and institutional hierarchy and reporting relationships among all the stakeholders are not clearly defined. Commercial banks could play an increasing role. There is the need therefore to clearly define relationships and roles to enhance effective implementation and delivery of services. In order to promote the sub-sector, the various stakeholders organize training programmes and activities with the view to upgrading the human capital in the industry. Nevertheless, the staffing and competency level being achieved with these training programmes is still below what is desired. Thus, the human capacity of some key stakeholders and institutions including MASLOC, GHAMFIN, MFIs, relevant Ministries, and technical service providers etc needs to be enhanced for microfinance operations. The random and incoherent nature of training programmes has also probably hampered the achievements of the projected gains for the sub-sector, as the flaw in the human capacity of all the stakeholders may have had a rippling effect on the governance and structure of the industry. Furthermore, the current microfinance Apex bodies lack an adequate cadre of in-house trainers and/or facilitators as well as in-house monitoring and evaluation units to continually measure progress of their activities consistently over time. Infrastructural capacity in the sub-sector is yet to be developed around an integrated and holistic logistical support and internal operating systems. Funding for the sub-sector has been from three sources: the institutions themselves, government, and development partners. Firstly, available funds have not fully 'met the needs for developing and expanding the sub-sector; and, secondly, the varying sources come with their conditions, and distort the market in some cases. There is considered to be a need for a central microfinance fund to which MFIs can apply for on-lending and/or capacity building support, building on experience such as the Training Fund under the Rural Financial Services Project. The current strategies for credit delivery are not adequately diversified or efficient, and therefore are unable to fully meet the varying demands of the market and different categories of end-users. There is no framework for categorizing and upgrading some of the emerging microfinance institutions in the semi-formal and informal sub-sectors in accordance with their operational capacities and capabilities. The objective of microfinance is to provide resources for the poor. Nonetheless, there is yet to be adequate, reliable and acceptable methods for classifying various poverty levels to enhance the categorization of potential and actual MFI clients and other forms of support that may be more appropriate for some groups. Generally, there is paucity of information on microfinance institutions, their operations and clients in the country. Approaches to and methodology for data and information gathering at the national level are not uniform, making it difficult to centrally monitor progress of the sub-sector. The current attempt to develop a national data bank on microfinance is yet to be fully realized. There is a lack of well defined reporting system by both the government and development partners with regards to their interventions. The outcome is inadequate data base for decision-making and planning. At the institutional level, data/information gathering and dissemination are weak within and between institutions. The lack of common benchmarks, methods for measuring and information sharing further inhibits the performance of the sub-sector. Lack of adequate and reliable information on outreach in terms of its depth and breadth remains one of the most daunting in the sub-sector. This lack of information has affected targeting of clients and ultimate poverty reduction. There is a need for dialogue on the formulation, implementation and review of regulatory and supervisory policies and procedures to ensure consistency and cost-effective approaches to regulation across different types of microfinance institutions and products. There is a need to balance permitting continued evolution of a variety of institutions providing microfinance products and services with the need to protect depositors' funds, provide adequate information and protection to consumers, and coordinate expansion and regulation of different segments of the market. Microfinance institutions in this category face rigid regulatory and supervisory systems that present some challenges for product innovativeness, outreach and ultimately the performance of the institutions. There is a lack of well specified guidelines for operations among apex bodies namely, CUA, GCSCA, ASSFIN and Cooperative Council. This leads to uncoordinated activities and invariably hampers the performance and outreach of their member institutions. There is no national body which is responsible for coordinating all activities associated with microfinance, nor is there a forum for dialogue among stakeholders on policy and programme issues. As a result there is lack of coherent approach, fragmentation, duplication and inadequate collaboration between and among MDAs, MMDAs, development partners, service providers, practitioners and end users. In this regard, the role of GHAMFIN as an umbrella body for microfinance apex institutions, as well as their member institutions, needs to be strengthened to ensure the transfer of best practices and setting of standards for the industry. The existing institutional structure does not include all practitioners and service providers, and needs to be addressed. In all, the potential economic benefits of sustainable microfinance in Ghana are compelling, and its potential effects on the development process cannot be understated. This calls for a holistic approach, as discussed to facilitate the development of the microfinance sub sector and thereby unleash its potential for accelerated growth and development. People/households with an income below a certain threshold level irrespective of their standard of living. overty is defined to include low level of income, the absence of medical care, poor sanitation, the absence of good drinking water, illiteracy, the inability to participate effectively in decisions that affect an individual's life directly; and the lack of security and protection from crime. Microcredit is the provision of cash and in kind loans in smaller amounts to micro, small entrepreneurs meant to improve their business operations. Microfinance consists primarily of providing financial services including, savings, micro-credit, micro insurance, micro leasing and transfers in relatively small transactions designed to be accessible to micro-enterprises and to low-income households. Microfinance may be complemented by non-financial services, especially training, to improve the ability of clients to utilize the facilities effectively. The formal financial sector in Ghana includes the Traditional Commercial Banks, Rural and Community Banks and other financial institutions such as the Savings and Loans Companies whose operations are registered, licensed and regulated by the Bank of Ghana. The sector comprises of informal institutions that are formally registered but not licensed/regulated by Bank of Ghana such as the Credit Unions of Ghana, Ghana Cooperatives Susu Collectors Association, Ghana Cooperative Council and Association of Financial Non-Governmental Organizations. They constitute the key stakeholders of the Microfinance Sub-sector in Ghana. The informal financial sector is the components of the financial sector whose service providers are usually not registered and unregulated by the Bank of Ghana and rarely involve legal documentation. The segment includes Money lenders, Susu clubs, Rotating Savings and Credit Associations (ROSCAs). Littlefield, E., Murduch, J. & Hashemi, S. (2003). Is Microfinance an Effective Strategy to Reach the Millennium Development Goals?, Focus Note Series no. 24. Washington: CGAP -Consultative Group to Assist the Poor. Rosenberg, M. 2004. "Never the twain shall meet", English Teaching Professional 11(35): 36-37. The authors can be contacted at johnson.asiama@bog.gov.gh or jasiama1@yahoo.com. An earlier version of this paper has been included in the Bank of Ghana publications. Work on an amendment of this Act is however underway. Susu Collectors in Ghana are recognizable for their distinctive, many pocketed coats. Traditionally, they service a set area or group of families with whom they have developed a long relationship.